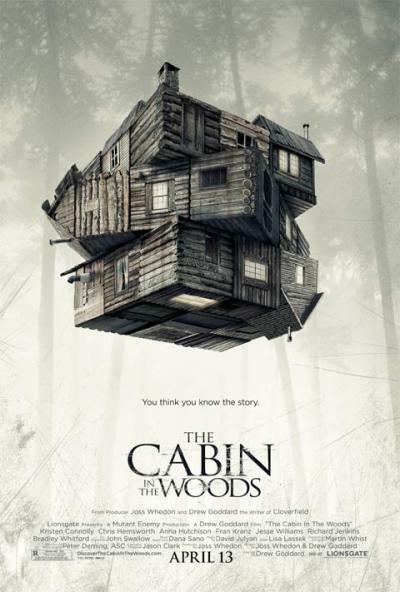 I went into “Cabin in the Woods” with zero expectations. I tried to stay as far away from the hype machine as possible. I avoided all trailers and tv spots, I didn’t read a single review, and I didn’t watch a single interview with any of the cast or crew. I wanted this movie going experience to be as “pure” as possible. All I knew going in was that it was written by Joss Whedon (creator of “Buffy the Vampire Slayer”) and it featured a college aged cast trapped in a cabin…in the woods. Seriously, that’s all I knew going into the film. I didn’t want to know the twists and the turns. I know what expectations can do to a person and I know especially what it can do to a horror fan. So into the movie I went with a clear head ready for a new tale of terror. Let the carnage begin! “Cabin in the Woods” begins with five college students driving out for a vacation to a remote cabin in the woods. Among the group we have the beautiful and slightly “impure” Dana (Kristen Connolly) along with her attractive hunky jock boyfriend Curt (Chris Hemsworth). We have the plain but pretty Jules (Anna Hutchison) who is being set up for a date with book smart boy-next-door Holden (Jesse Williams). Along as the fifth wheel is the punchline stoner Marty (Fran Kranz). That’s all I’m going to tell you. Giving away what happens before or after this event will most likely hinder your enjoyment of the movie. All I can say is that some will die, some may live, and there is plenty of blood to be sprayed all around. If there is one thing that has to be said for “Cabin in the Woods” it is that it has a ton of ambition. Far more so than any other horror movie I’ve seen in years. The “twist” (which I refuse to give away even though many, many trailers and reviews have) is very clever and ingenious in concept. Like other “meta” horror movies, I enjoyed the references “Cabin in the Woods” made to past horror movies (particularly those in the slasher genre). However, that is where my love for the movie both began and ended. I thought this movie was a bit of a mess with no real follow through and an ending that was just lazy screenwriting. I appreciated the concept behind this movie (which, again, I don’t want to give too much away so I am being deliberately vague) but found the execution lacking. I also hated pretty much all of the characters and the “comic” relief felt flat to me. I couldn’t wait for the “stoner” character to die and the less said about that, the better. I can understand and appreciate why people love this horror movie. It’s something different. It isn’t PG-13 and it isn’t a remake. Nonetheless, I was left quite cold. This film attempts to be a clever horror-comedy packed with meta self awareness. Clever it is. Funny or scary? Not so much. This film is being billed as “Scream” for the next generation. That it is not. “Scream”, for all its meta self awareness was both scary and funny as hell. Everything and everyone associated with this picture appear to either be trying far too hard or not enough, I’m not exactly sure which. I know I am in the minority here so if you have a desire to see this film by all means go out there and enjoy the hell out of it. I wanted to and didn’t. I appreciate it when any horror movie gets recognition and acclaim. I love to see horror movies that make people fall in love with genre again. If I didn’t fall in love with this one, that shouldn’t stop you.